About Tate Estate Sales LLC. Estate Liquidation Services in Sonoma, Marin, San Francisco and Napa counties. We manage liquidations for International job transfers, probate sales, downsizing as well as long and short term brokering. We love our customers and we look forward to seeing them at every new sale. Also, along with an extensive email list of estate sale aficionados, we have developed a tight network of trusted re-sellers. We have fantastic references and hope you think of us when looking to liquidate. Please carefully inspect your purchases as ALL SALES ARE FINAL. Due to high chiropractor bills, we ask you kindly to move your own purchases. Pre-sales for Tate Estate Page Followers only, unless your purchase is $500.00 or more. In that case contact us for appointment at 415-302-3496. 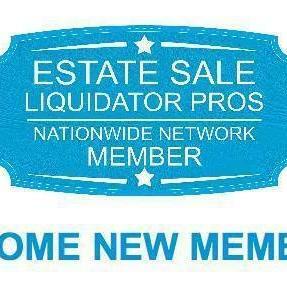 Estate Sale Liquidarion Pros, Nationwide network member. Estate of Rolf Olness M.D. Just a few blocks off the square, experience an estate from generations of collecting. Last Chance to make purchases. A lifetime of items in one home, this estate is wall to wall packed. 50% off everything both Sat & Sun. 50% off @ Noon -Bennet Valley Downsizing sale , Jewelry, collectibles, designer mens and womens clothing, newer appliances, furniture and collectibles. Pristine Oakmont Downsizing Estate is back on. Large San Rafael Estate, Furnishings, 2009 Acura, instruments, clothing and more. Our beloved Char is moving away and liquidating her home. Last chance to buy @ Windsor Estate Sale Most items 50%off marked price, EVERYTHING must go. 1 More Day @ our Novato Estate Liquidation @ 50% off all merchandise. STARTS FRIDAY Step back into the 1960s in this Sebastopol Estate W/ Herman Miller furnishings and hand spun pottery. 50% off at NOON Meticulous Oakmont estate, with something for everyone. Updated solds on FURN. 50% off @ 12 on Sunday! Large Sebastapol Farm liquidation, 3 generations in one home. Unique items from estate in Las Vegas. VEHICLES call Michael 707-495-4367 l $12,888.00-2007 Sierra 47’ Trailer with 2 pop outs. Paid $44k 3 years ago. RAIN OR SHINE Janis Joplin, Beatles, Led Zepplin, Miles Davis with COA, Bongo Drums, Guitar, Speakers, Art and Furniture. 50% off everything UPDATED HOURS Rain or Shine -Exciting Oakmont liquidation, Furniture, Lg.Book Collection , Huge assortment of Women’s clothing, shoes, purses and more. Large Downtown, Santa Rosa after Christmas, Going out of Business Sale. NEW DATE Nov 10th,11th,12th ,New Orleans Antiques, Asian Furnishings, SF restaraunt player piano and more. Fun Sonoma Estate Liquidation, Mid Century/Contemporary. furn. great Collectibles and more. Sonoma , 4 acre farm sale with vintage tractor, tools, farm equipment, vintage stoves, vintage Ice box and more. **LAST CHANCE **50 % off of everyrhing OF Huge Commercial and Residential Liquidation in Cloverdale, something for everyone. *NORTHERN NOVATO* Remodeling Sale, Furnishings, Appliances, Fixtures and more. Every piece of furniture in this 60's built home is one of a kind, you won't want to miss this one. This company has posted a total of 132 estate sales. Only the most recent 50 sales are shown. What People Say About Tate Estate Sales LLC. Diana was great to work with. She did everything she promised and more. Communication was terrific. Diana offered sound advice and suggested we change the sale date when the weather was looking bad. She quickly rescheduled the sale and the sale was a big success. Diana offered us so much help in emptying the house and took care of so many details for us. We live out of state and we were completely comfortable not being at the sale. Trustworthy, hardworking and honest! I always try to make their fun sales! Good stuff. Good people. The best there is in Sonoma county. Her sales are the best around! Very helpful staff, prices great, vast array of items. Great quality and service. What a great and efficient job they did on an estate sale for a house I had for sale. They shined even though the weather didn't and their flexibility made it all work. We have gone to several Tate Sales events and have always found them to be first class, professional. Bought many wonderful items at reasonable prices look forward to attending again! Absolutely love Tate estate. More than accommodating, super friendly and helpful. I've been to 2 sales now and each time I've left happy and completely satisfied with my prices and items. Thanks so much for making your estates a joy to go to, can't wait for the next! We had a really good experience working with Tate Estate Sales. Our items were unique and we were concerned we weren't going to be able to reach the appropriate potential market for our sale. Tate expertly handled communication to get the word out and we had wonderful response and as a result were able to sell many things we thought would be nearly impossible. Everything was presented beautifully and our items were really allowed to shine. They really made the process simple and efficient. Highly recommended! Fantastic; highest recommendation. Professional, organized, communicative, respectful. We needed Diana and Michael for a large sale within a tight time frame, and they came through for us and made everything happen with as little pain as possible. I hesitate to share how many "little extra things" they did for us to facilitate a quick emptying of our property, for fear of creating those expectations for everybody! :) But suffice it to say that they were everything we could have asked for in an estate sale company, and more. Their staff is quick, efficient, and personable, and everyone worked with a calm demeanor and a smile. Thank you all for your amazing efforts!!! Diana Tate is the most genuine and honest person I have known. Her first sale was for one of my customers who had lots of art and collectibles. Everything Diana did from the start was first class and ethical. Diana did amazing research on valuation, good layout, and provided good security . My customer was extremely grateful and happy. To refer Diana (Tate Estates) to anyone. This review is long overdue, but I have so much gratitude for Diana Tate and her team, it’s better late than never. Last year, I was responsible for managing my parents’ home and estate in Sonoma. It was quite an overwhelming and emotional task having to sift through a lifetime of possessions. I was also unsure of what to do with all of the home goods which my siblings and I had decided not to keep. Since I live in Southern California, I was not nearby to advertise and sell those valuable items. I am so glad I met Diana of Tate Estate Sales! I wished I had known about her before I had started going through my parents’ things, but now I know how it’s done and I would highly recommend anyone in my shoes to reach out to her sooner than later! After meeting Diana, she put me at ease and I no longer had to worry about how I was going to empty my parents’ house. Diana was very kind, empathetic, fair with her commission structure, and easy to communicate with via text, phone or email. The estate sale was well advertised, and it exceeded my expectations. Tate Estate Sales has a strong following of customers and over the course of two days, the majority of the furniture and home goods were sold. I was elated that the unique and well-cared-for mid-century modern furniture that my parents had in their home since the 60’s and 70’s was sold for top dollar. Thanks, again, Diana and team. I was happy that I was able to refer you to a Sonoma real estate agent, and I will continue to do so! Recently, my 3 brothers and I were introduced to Diana and Michael of Tate Estates. Our parents had recently passed away and we were now responsible for the liquidation of 90 years of their lives. Over those years, my parents had acquired many unique and wonderful things. Our father was a craftsman who built his own furniture and restored his own 160 year old home almost single handed. He was famous for rescuing old things and making them new again. Our mother was a frequent estate shopper herself, who appreciated fine things and owned many things passed on down to her from her own parents who migrated to the United States in the late 1800's. The thought of this task was over whelming. to nonprofit organizations for donation. Even a dump run was organized by Michael and Diana. They made a very difficult and emotional time for us much easier. Thinking back, I don't how we could have done it without them. I think the most valuable thing I can say about them is that they treated our parents estate as if it were their own. I sensed the empathy they felt for our family. For that we are both grateful and thankful to Diana and Michael. I am more than pleased with the extraordinary job done by Diana, Michael and staff at Tate Estate Sales. I had a particularly difficult time letting go of my Dad and step Mom's possessions, as they are still living but incapacitated with dementia. Since I am their trustee, I needed to do the responsible thing by selling their home and possessions to make sure there is adequate money available for their care. Diana and Michael were both wonderful. They were kind, professional, and very, very knowledgable. They kept me informed every step of the way regarding the process. They made sure to put aside anything which looked like it may have sentimental value to myself or my two sisters. They even took extra care to find some jewelry one sister really wanted. Though it felt wrong on a gut level to me to sell my parents things while they are unaware of the steps we are taking in providing them the best care, it was of course very necessary. The loving and respectful approach of Diana and Michael made all the difference in the world. They made far more money than I ever expected as well. We had a huge turnout of people to the sale, and even were able to sell my Dad's piano. I did not have to do anything at all. Every part of the process was taken care of by Tate Estate Sales. By the time they were done, the house was completely empty, swept, and ready to fix up to sell. I am so very, very thankful to them both, and so incredibly grateful that I contacted Tate Estate Sales. I highly recommend them to anyone! For out of the area owners, what I liked most is that in the end as promised, the house was clean, with all items donated or taken away. Tate Estate Sales made it very easy to transfer the house to the buyer. We were also pleasantly surprised by how much we received for my Aunt's personal items. They eased our worries and made the process painless. Great service and people, and would recommend them to my family and friends. We want you to know how much we appreciate the job you performed putting on our Estate Sale. Cloverdale is off the beaten track and we were doing a major downsizing, but your advance advertising and publicity (especially on social media) and the signs throughout the town created the interest that was needed and brought a gratifying number of customers to the sale. Your attractive arrangement of our furnishings and effective salesmanship then moved a surprising number of items. We were most pleased at the results. We want to thank you particularly for your assistance in removing the last of all the items and cleaning up after the sale. Our timing was tight and it was marvelous to have it all behind us in order to meet the closing date. about how emotional it was for me to let go of my mother’s things. for your all of your help. Follow Tate Estate Sales LLC.